At The Dinner Club, there are different options to help make dinnertime a whole lot easier. Because we do all the shopping and chopping for you, making dinner will be a whole lot quicker, and very delicious. See the options below. During one of our sessions, you will assemble 8 or 12 family-sized dinners, each serving 4-6 people. For smaller families, you can "split" each dish into portions for 2-3. Some meals can be cooked from frozen while others may need to thaw in the fridge for a day or two. 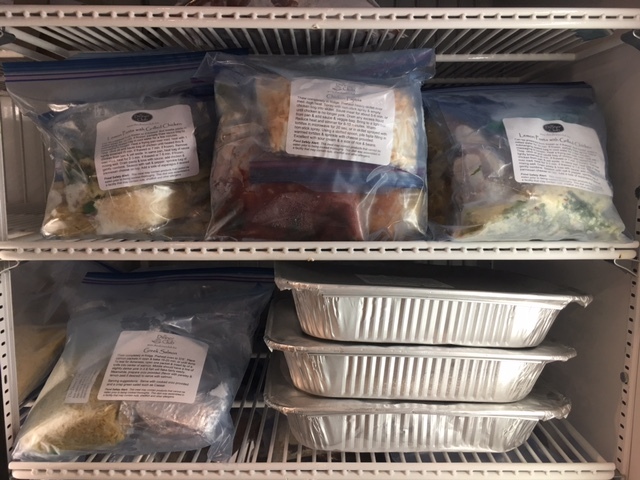 Take your meals home and store them in your freezer. Use the meals when you need them most. Some can be cooked from frozen. Others need to be thawed in fridge. Another great option is to have The Dinner Club make your customized meals for you. For an additional fee, we will make your meals just the way you like them. Place your order on line for a time slot that works for you to pickup your meals. Special instructions can be added in the notes section when ordering. Pickup your meals during your scheduled time or call us to arrange a special pickup time that works for you. Store the meals in your freezer and use them when you need them most. The Dinner Club is a great place to spend time with family, friends and/or co-workers. Making dinners together is not only productive but a lot of fun and a great way to spend time with friends. Wine is available to be purchased and enjoyed with your group. No reservation is required to stop in and choose from our great selection of pre-made meals. We stock our freezer daily with delicious dinners that can be used that day or in the month ahead. Tuesday through Saturday we have fresh meals available to get dinner on the table even quicker.